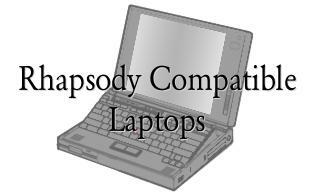 One of the questions I have been asked quite often is "what laptops work with Rhapsody?" And actually, it was my first question when I started wanting to run Rhapsody too. At the time I had NEXTSTEP and was planning on getting OPENSTEP and Rhapsody 5.1, and there were display drivers that specifically named the IBM ThinkPad 760ED... so I got a ThinkPad 760ED. This worked great with NEXTSTEP and OPENSTEP, but I ran into an issue with Rhapsody. Apple had changed the installation enough that you couldn't swap the internal floppy drive with the internal CD-ROM drive during the install. This was why I ran OPENSTEP on my ThinkPad until 2000, that was when I got an external floppy drive. For the most part, my needs had been satisfied so I didn't think much about it after that... but I was still getting asked from time to time. Part of the problem is that it is hard to find good references for the actual hardware used in the laptops of PC makers. There are so many makers of PC laptops and their documentation is on the whole quite lacking. Add to that the fact that some of the drivers listed by Apple for Rhapsody don't get very specific either, and the matching up what hardware works with Rhapsody becomes quite a daunting task. As I said, I have a working system on an IBM ThinkPad, so that seemed like a good place to expand first. I assumed that the chip set used in the 760ED wasn't unique to that ThinkPad, so that driver should work with other models that used the same chips. I found a neat site (here) which broke down the hardware of just about every ThinkPad you could think of. This turned out to be a great resource for matching drivers to chips. Another place I looked to was the Omni Groups mailing list (MacOSX-admin and MacOSX-talk) from around the time that Rhapsody 5.1 was released (May 1998 to July 1999). I looked for any references to running Rhapsody on laptops to help get an idea of what people had tried and (more importantly) what they had been successful with. With a nice list of hardware to work from I was able to not only find out what systems I had display drivers for, but also what systems I had sound drivers for too. The two driver bundles that come into play with the ThinkPads are "IBMThinkPad760EDDisplayDriver.config" and "ES1x88AudioDriver.config". What I found was that the 560 uses the Trident Cyber9382 chip set, the 760E uses either the Trident Cyber9320 or Trident Cyber9385, and the 760ED uses the Trident Cyber9385. So the "IBMThinkPad760EDDisplayDriver.config" driver bundle should work with any of the ThinkPads that came with the Trident Cyber9320, Cyber9382 or Cyber9385. On the audio side... well, I've never had audio from my ThinkPad. The audio hardware in the 760ED (IBM Mwave Audio) wasn't supported by any of the drivers for Rhapsody (or NEXTSTEP/OPENSTEP for that matter). But I did notice that the ThinkPad 560 used ESS1688 Audio, which is covered in the "ES1x88AudioDriver.config" (which includes "ESS PnP Audio" and "ESS 1x88 Audio"). Based on the drivers available and what reports of success I've seen, there is the possibility that the following systems may be usable (that is, they may work with the video drivers). Most of these system use the ATI Rage Mobility M or M1, which seems to be able to be made to work with Rhapsody's ATI Rage Display Driver. Note: none of these systems has been tested with Rhapsody nor are there any reports that they work.